If your surgery requires an overnight stay, you will be admitted to NewYork-Presbyterian/Weill Cornell Medical Center. The NewYork-Presbyterian Hospital web site maintains an up-to-date listing of patient guides, with information on visiting hours, meals, gift shops, and other hospital services. You will also find information about nearby hotels and restaurants as well as answers to your insurance and billing questions. 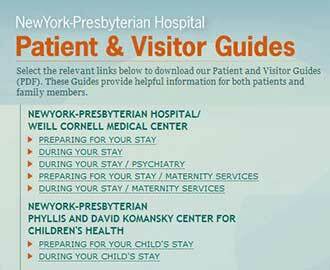 See the NewYork-Presbyterian Hospital Patient Guides.